Since the beginning of the law firm in 1924, we have maintained a reputation of excellence. Each attorney throughout the history of Appleby Healy Law has left his own unique legacy. Our attorneys today continue to strive to make a difference in their local communities. 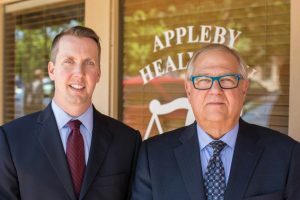 Please explore how Appleby Healy Law firm lawyers have shaped the history of, the city of Ozark, Christian County, and the local region by interacting with the timeline below. John T. Moore and Charles Farrar started a new law firm in Ozark, Missouri. Moore’s son, Tom, joined the practice & Charles Farrar moved to Dallas County to start a new firm. Joe Crain joined the practice. John Moore was elected as the Circuit Court Judge of Christian County, Missouri. Sam Appleby joined the practice. Joe Crain became the Circuit Court Judge of Christian County, Missouri. Tim McCormick joined the practice. Sam Appleby was elected to be the Associate Circuit Judge of Christian County. Sam Appleby died while in office, and Anthony McConnell was appointed to fill the judicial vacancy. The law firm consists of David Healy as the principal along with David Appleby, Robert Ingold, and James Whiteside bringing over 100 years of combined legal experience with office hours kept in Ozark, Springfield, and Bolivar, MO.